Welcome to Day #12 of Chocolate and Venezuelan Theme Week. Today's Cuyagua Village Venezuela Dark Chocolate bar was from Amano Artisan Chocolate (Orem, UT). 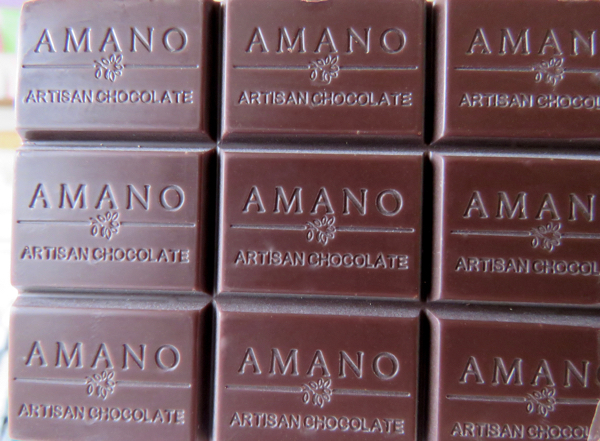 This 70 percent dark bar was made with cacao beans grown in the small village of Cuyagua, on the Caribbean coast of Venezuela. 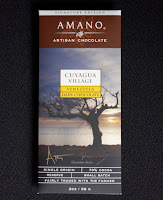 Tasting notes: "Cayugua has beautifully complex flavor notes of spice, melon, and cream." This bar was at once smooth and complex, with mild spice (almost five spice), green notes, light fruit, very subtle and almost floral notes, and the aforementioned cream. And it evolved over the day after it had been opened to include other flavors.